West Virginia Attorney General Patrick Morrisey, a Republican candidate for the U.S. Senate, voted for Donald Trump at the Republican National Convention in 2016. He voted for Trump in the Electoral College, too. Morrisey has admitted that Trump was not his first choice to be the Republican nominee for president. He also went into the convention as one of three delegates from West Virginia who were not committed to any of the Republican candidates. In the end, Morrisey cast his vote for Trump to be the nominee, as did the rest of the state’s delegation. The 15-second attack ad is sponsored by the U.S. Senate campaign of Rep. Evan Jenkins. He and Morrisey are competing against four other Republicans in the May 8 primary. The victor will face the winner of the Democratic primary, where Paula Jean Swearengin is challenging incumbent Sen. Joe Manchin. A graphic shown on the screen says this about Morrisey: “Said he would not … support the Republican … candidate who gets the most votes.” That’s attributed to an April 14, 2016, article by West Virginia’s MetroNews. The MetroNews then quoted Morrisey saying that both Trump and Sen. Ted Cruz, who also competed for the GOP nomination, had messages that appealed to voters in West Virginia. Those statements were all made before Trump won West Virginia’s GOP primary on May 10, 2016, with 77 percent of the vote. The Jenkins campaign has emphasized that Morrisey neglected to publicly support Trump by name before casting his vote at the convention in July 2016. “Morrisey repeatedly and explicitly reiterated that if elected as an RNC delegate, he would make his own ‘judgment choice’ about whom to vote for at the convention, rather than vote for the candidate who won West Virginia’s primary,” Jenkins spokesman Andre Seré wrote in an email to FactCheck.org. Morrisey may not have pledged his support to Trump before the convention, but he cast his vote for him to be the nominee nonetheless. That means that West Virginia Republicans weren’t denied their choice. Graphics that appear on screen say that “Morrisey chose not to endorse Trump,” and “opposed Trump’s candidacy.” But neither quote refers to the general election. 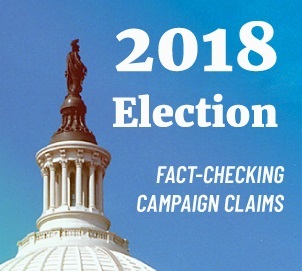 The first quote is attributed to a March 5, 2017, Washington Examiner article that refers to the primary election, and the second quote comes from a “fact check” on a website paid for by the campaign of former coal executive Don Blakenship, who is also running against Morrisey and Jenkins in West Virginia’s Republican Senate primary. The post on that site claims that Morrisey “opposed Trump’s candidacy” because he “refused to endorse Trump” during the run-up to the GOP convention. In addition, the ad’s image of Morrisey and Clinton seemingly shaking hands appears to be a fake. We couldn’t find it by doing an internet search, and Seré, the Jenkins campaign spokesman, said that he “couldn’t confirm the original sources” of the image, either. “[J]ust as Morrisey’s campaign and his super PAC do in each of their ads portraying Evan with Hillary, Obama, Pelosi, etc., we sometimes take creative license while arranging images in order to help make a substantive point,” he admitted. The Morrisey campaign has used side-by-side images of high-profile Democrats and Jenkins in digital ads. But the reality is that Morrisey said prior to Election Day that he was committed to supporting Trump against Clinton. Furthermore, Morrisey told the Associated Press in December 2016 that he voted for Trump in the general election. He was also one of West Virginia’s five electors who voted for Trump in the Electoral College, as well.